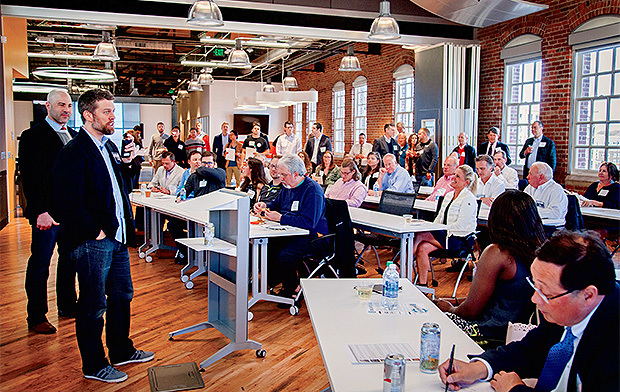 On a Friday afternoon in April, about 150 people crowded into the Bullpen, Duke’s Innovation and Entrepreneurship hub in downtown Durham, filling the high-ceilinged spaces of the former tobacco warehouse alongside walls of whiteboards and flatscreens. They were there to listen as seven entrepreneurs pitched them their ideas for applying technology to a profession that has historically been resistant to such overtures: the law. The teams had spent 12 weeks in the Duke Law Tech Lab, a new incubator for startup companies that leverages the Law School’s and Duke University’s community of faculty, students, and alumni to support cutting-edge innovations in the delivery of legal and regulatory services. They were now competing for cash prizes, an ongoing affiliation with the Tech Lab, and a chance to capture the interest of the venture-capital investors, law firm chief information officers, and members of the Triangle’s burgeoning entrepreneurial community in the audience. One team, TrustBooks, pitched software to help lawyers manage client funds held in trust, using cartoons and a stripped-down PowerPoint presentation to emphasize the system’s user-friendliness and reliability. Another, Skopos Labs, offered a program using complex linguistic algorithms and artificial intelligence (AI) to make real-time predictions of a bill’s chance of passage through Congress. That spectrum of ideas — simple tools to streamline processes or reconcile incompatible systems at one end, AI-driven high-stakes prognostication at the other — provided a snapshot of the field of legal technology, a field that has already reshaped some facets of the profession and is in the process of radically changing others. The establishment of a new Duke Law Center on Law & Technology and the launch of the Tech Lab, along with the development of the LLM and JD/LLM in Law and Entrepreneurship degree programs and the Start-Up Ventures Clinic, and the engagement of the Center for Judicial Studies with the profession on e-discovery and other legal technologies, reflect the Law School’s drive to stake out a leadership position in this field. For students preparing for the shifts and opportunities spurred by technological change, there are new classes on technology in finance and banking — “fintech” — writing for e-discovery, and “smart” contracts, as well as clinical initiatives, workshops, practicums, and externships. Familiarity with technological innovation is a given for students who know they will be advising startups or following an entrepreneurial path themselves. The extent to which that innovation has begun to permeate every aspect of the legal profession is a newer phenomenon. Many students, regardless of their practice areas, will go to work at firms where a chief information officer oversees such matters as e-discovery, compliance reporting, and conflicts. Conversance in technical terminology as it affects the discovery process, cybersecurity, contractual agreements, among many other facets of a legal practice, is becoming essential. Technological advances have been reshaping the litigation process for more than a decade — the first e-discovery-related amendments to the Federal Rules of Civil Procedure went into effect in 2006. Those advances continue to transform the litigation process (and litigators’ professional lives) in ways both large and small, from exponentially increasing the amounts of information processed and driving the development of tools needed to efficiently process that information, to vastly improving options for courtroom presentation and introducing social media into the jury selection process, says David Lender ’93, co-chair of the global Litigation Department at Weil, Gotshal, & Manges and a member of the Law School’s Board of Visitors. The explosion of mass electronic communication into multiple formats — Lender cites one client whose employees use email and four different instant messaging platforms — has companies and law firms investing heavily in ediscovery and Technology Assisted Review (TAR), which adds the self-learning capabilities of artificial intelligence to e-discovery’s high-powered search-and-sift capabilities. Beyond that precipice is artificial intelligence. AI innovators such as ROSS Intelligence offer platforms that turbocharge document review and perform tasks such as searching out similar fact patterns and relevant legal decisions. Such firms as Latham and Watkins, Sidley Austin, and Simpson Thacher are now working with the company. ROSS CEO and co-founder Andrew Arruda spoke to Duke Law faculty last fall at a retreat that Levi calls “eye-opening.” Since then, ROSS has partnered with Duke to provide mentorship to the Tech Lab teams and create a summer internship program for interested Duke Law students. Next up: distributed ledger technologies such as blockchain, which are seeping into the practice of law, says Clinical Professor Erika Buell, who advised start-ups and technology companies before coming to Duke Law. Blockchain, the technology underlying cryptocurrencies such as bitcoin and ether, relies on a synced, shared database system, where multiple parties can access automatically updated records simultaneously, without accessing the same centralized network. Considered highly secure and resistant to retroactive tampering, blockchain has the potential to upend many aspects of transactional law. Blockchain and some related platforms also allow for the construction and execution of smart contracts, where the contractual provisions are built into the computer code. Buell says endeavors like the Delaware Blockchain Initiative, introduced in 2016, point to the staying power of the technology; among the initiative’s provisions are the amendment of Delaware law to expressly allow corporations to track shares issuances and transfers using blockchain-based technology. Buell’s Contract Drafting: The Next Generation course, which she developed and taught for the first time last fall, delved into smart contracts and blockchain technology. She was initially interested in giving students a different lens through which to view contract drafting, but she also exposed them to graduates practicing in the blockchain space with such guest lecturers as Ian Darrow ’15, general counsel and chief compliance officer of LedgerX. The New York-based company is awaiting regulatory approval to become the first federally regulated bitcoin options exchange and clearinghouse. Clinical faculty and students discussed their ideas for technological tools to facilitate expansion of legal services to their clients at a workshop on Feb. 24. The Law School is striving to ensure curricular innovation keeps pace with technological innovation, not just in traditional skills courses like Buell’s but also in new offerings such as Law of Robotics and Exponential Technologies. Like Buell, Baxter and co-teacher Lee Reiners relied on practicing professionals and other guest lecturers when they taught Fintech and the Law. Among them were Douglas Arner, the Ken Yun Visiting Professor of Law, who addressed the global spread of fintech, and Lin Chua LLM ’00, co-founder and COO of digital lending company InterNex Capital. Outside the classroom, the Center for Judicial Studies has been working with judges, lawyers, and law faculty to create clear guidelines for e-discovery since its acquisition last year of information-governance and e-discovery resource center EDRM. The center had already worked to define the role of e-discovery in litigation by hosting conferences, covering the topic in its quarterly journal, Judicature, and publishing Guidelines and Practices Implementing the Discovery Proportionality Amendments. With the ABA Litigation Section, the center held roadshows in 17 cities in 2015 and 2016, engaging lawyers and judges in a national conversation about the amendments. In May, the center hosted its first workshop with EDRM members, discussing potential projects and reviewing an ongoing effort to develop standardized guidelines for TAR. At Levi’s behest, Ward has also launched a targeted effort to develop legal tech that addresses access to justice challenges. In the fall, he spearheaded the Access Tech Tools initiative, a project in which clinical faculty and students developed ideas for tools that could help expand access for or otherwise empower their clients. Keith Porcaro ’11, CTO and general counsel of SIMLab, a nonprofit focused on helping people and organizations make systems more responsive and accessible through technology, is helping to lead the initiative. “One of the reasons why emerging technology is exciting, why it shouldn’t be seen as a difficulty to overcome, is the potential it has to make legal services available to so many people who need them,” says Levi. Among the projects the clinics have developed: A 501(c)(3) filing preparation tool for nonprofit organizations from the Community Enterprise and Start-Up Ventures Clinics; a document-automation tool to help social workers, AIDS case managers, and health-care professionals provide efficient referral and intake summary documents to the Health Justice Clinic and other service providers; and from the Children’s Law Clinic, a tool to speed up the process for parents applying to the Social Security Administration for disability benefits for their children. Porcaro says projects like these, largely aimed at increasing efficiency in service delivery, are in line with ones he designs for such clients as Bay Area Legal Aid, and the Mississippi Access to Justice Commission. Rose McKinley JD/LLMLE ’17, who served as student supervisor for the Access Tech Tools project while enrolled in the Start-Up Ventures Clinic, says the initiative was an opportunity to get entrepreneurial experience while addressing real problems in access that technology could inadvertently be perpetuating. The Children’s Law Clinic tool could improve quality of life for disabled children and their families, for example. Keith Porcaro ’11, CTO and general counsel of SIMLab, co-led the Access Tech Tools initiative and the Feb. 24th workshop. Lawyers need to stay equally engaged with technological change in other areas of practice, policymaking, and regulation, says Weil’s Lender, noting that technology demands adept attorneys in order to function optimally. TAR, for instance, relies on input from lawyers to determine how best to search for relevant documents, he says. Warren '08, Georgia Supreme Court justice, advises attorneys to "prepare to engage with the court"